One of the items up for auction at the Smoky River FCSS dinner and silent auction. This year marks Smoky River Family and Community Support Services’ 51st anniversary and the organization held a dinner and silent auction at the Club Alouette in Falher during the evening of October 19, to mark the occasion. Eighty-nine people attended the event. Dinner consisted of Shepherd’s Pie, salad and dessert. 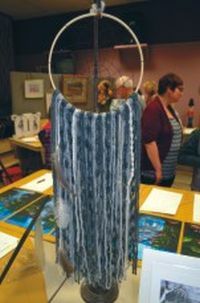 Among the items for the silent auction were paintings, knitted items, colourful aprons, a fur-lined jacket, a necklace, slippers and food items. Saskia and Darrel, the ‘Great Plains’ duo, was the featured entertainment. They performed at Smoky River FCSS’ 50th anniversary celebration last year, and like then, they performed music with Bluegrass, Celtic, Folk and Country flavours. These included tunes by Johnny Cash and Hank Williams. They set the mood, the ambience, with songs about the rural lifestyle, including cemeteries, farming and grain elevators. Saskia and Darrel provided stories and jokes occasionally, and they encouraged the audience to join in singing. Look for several videos of their performance on the Smoky River Express’ YouTuber Channel, and more photos at www.smokyriverexpress.com. Jean Moore-Lemoine, the Community Development Coordinator for Smoky River FCSS, praises those who came out. “The entertainment was awesome, and support for Smoky River FCSS is appreciated,” says Moore-Lemoine. The event raised approximately $2,300 and all the proceeds will go to the Smoky River Transportation Program. 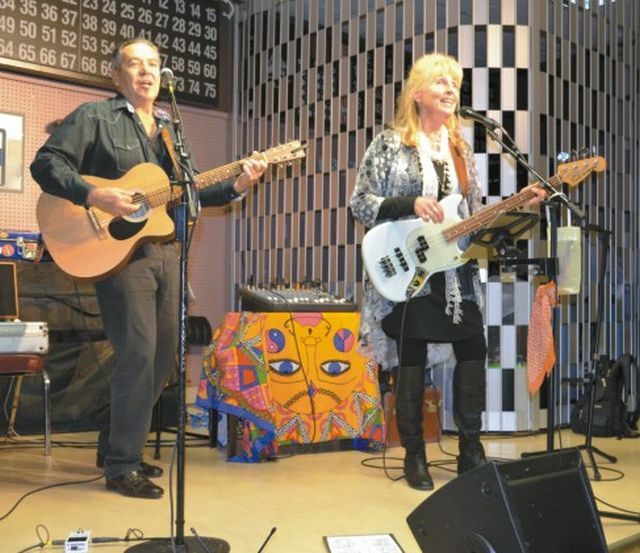 Pictured above, Saskia and Darrel, the ‘Great Plains’ duo, was the featured entertainment. They performed at Smoky River FCSS’ 50th anniversary celebration last year, and like then, they performed music with Bluegrass, Celtic, Folk and Country flavours. Look for a series of videos of their performance on the Smoky River Express’ YouTube Channel.